Arista Networks introduced its first two switches supporting 400 Gigabit Ethernet and designed for high-density leaf spine data center networks, including 100G connectivity to servers and 400G connectivity in the leaf-spine fabric. Both of the new Arista 7060X4 Series switches are based on the Broadcom 12.8 Tbps Tomahawk 3 silicon, support 32 400G ports in a compact 1U chassis. In addition, each 400G port can be split into four 100G ports, which supports a total of 128 100G ports in a 1U chassis. The switches uses industry-standard optics for 400G and offers the choice of two optical module form factors - OSFP and QSFP-DD. Both form factors offer a wide choice of 400G optics and cables, including optics that provide backward compatibility for 100G ports. Arista said both switches are fully qualified for its EOS. Enhancements in Arista EOS traffic management and load balancing take advantage of on-chip improvements in buffering and routing resources. Moving network tiers to 400G with high density 100G compute maximizes the performance of next-generation applications such as artificial intelligence, machine learning, and server-less compute through greater network speeds and by eliminating oversubscription between leaf and spine tiers. FlexE 2.0 -- initiated in 2016, the FlexE 2.0 project enables equipment to support new Ethernet connection types and FlexE allows network providers and operators to utilize optical transport network bandwidth in more flexible ways. FlexE can deterministically utilize the entire aggregated link, creating a more efficient alternative to the traditional IEEE 802.3ad or IEEE 802.1-based Link Aggregation (LAG) solutions which often can only utilize 70-80% of the available bandwidth. Key features of the FlexE 2.0 project include adding support for FlexE groups composed of 200GBASE-R and 400GBASE-R PHYs, in addition to groups composed of 100GBASE-R PHYs, and adding an option for the support of time and frequency synchronization at the FlexE group level. FlexE Neighbor Discovery -- this project recognizes that FlexE capability discovery is still required to facilitate the setup of FlexE groups and clients. The project introduced some extensions to the Link Layer Discovery Protocol (LLDP) for FlexE capability discovery. It enables remote FlexE PHY and deskew capability discovery, PHY connectivity discovery and verifications, and FlexE Group subgroup integrity verification. Common ACO Electrical I/O Project -- this implementation agreement follows the success of the CFP2-ACO optical transceiver implementation agreement but is form factor agnostic, so it also benefits analog coherent modules based on such form factors as CFP4, CFP8, QSFP, microQSFP, QSFP-DD and OSFP. The project defines the ACO electrical I/O independent of the choice of form factor and optical carrier count for 45 Gbaud and 64 Gbaud per-carrier applications. The FCC is proposing to make up to 1200 megahertz of spectrum in the 6 GHz band (5.925-7.125 GHz) available for use by unlicensed devices. The FCC said its proposed rules will allow unlicensed devices to operate in the 6 GHz band without interfering with the operation of the licensed services that will continue to use this spectrum. In those portions of the 6 GHz band that are heavily used by point-to-point microwave links, the FCC proposes to allow unlicensed devices to operate where permitted by an automated frequency coordination system and invites comment as to whether this is necessary for devices operated only indoors. In the other portions of the band where licensed mobile services, such as the Broadcast Auxiliary Service and Cable Television Relay Service, operate, the unlicensed devices would be restricted to indoor operations at lower power. FCC Commissioner Jessica Rosenworcel stated: "Today, Wi-Fi adds more than $500 billion to the United States economy every year—and $2 trillion globally. It has democratized internet access, helped carriers manage their networks, and fostered all sorts of wild innovation. In fact, it’s the perfect sandbox for experimentation, because access does not require contract or permission. As exciting as this is, it means the airwaves used by Wi-Fi are getting crowded. Already our current Wi-Fi bands are congested because they are used by more than 9 billion devices. By the end of the decade, we will see as many as 50 billion new devices connecting to our networks through the internet of things. Add this up. We’re going to need a significant swath of new unlicensed spectrum to keep up with demand. Now is the time to do something about it." In its Q3 financial report, Corning reported a year-over-year sales increase of 22% for Optical Communications. Sales exceeded $1 billion for the second consecutive quarter. Sales growth was driven by strong demand from both data center and carrier customers, and the acquisition of 3M’s Communication Markets Division. Net income was up 27% year over year, as capital investments yielded clear benefits. The company said it saw increased customer commitments that support accelerated capacity expansion. Strong growth is expected to continue in the fourth quarter, as additional capacity ramps, and the company supplies large projects underway at multiple customers in both the carrier and data center businesses. Fourth quarter sales are expected to be up by a low-single digit percentage sequentially, resulting in year-over-year sales growth slightly better than the third quarter. For full-year 2018, sales are expected to increase by a high-teens percentage over last year, with organic growth in the low teens and approximately $200 million in sales from the acquisition of 3M’s Communication Markets Division. 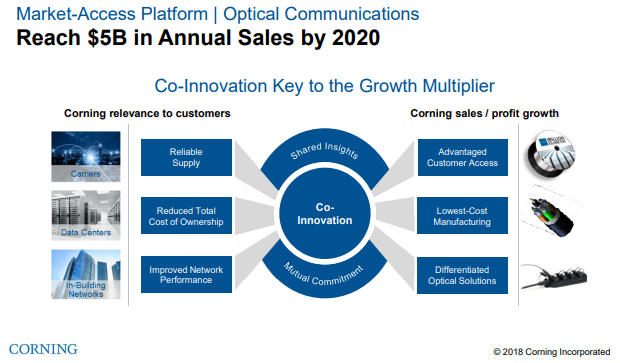 Corninng also cited share growth and said its optical business continued to progress faster than expected toward goal of $5 billion in annual sales by 2020. Juniper Networks posted Q3 net revenues of $1,179.8 million, a decrease of 6.0% year-over-year, and a decrease of 2.0% sequentially. GAAP operating margin was 13.6%, a decrease from 18.4% in the third quarter of 2017, and an increase from 13.3% in the second quarter of 2018. Non-GAAP operating margin was 20.0%, a decrease from 23.5% in the third quarter of 2017, and an increase from 18.5% in the second quarter of 2018. GAAP net income was $223.8 million, an increase of 35.0% year-over-year and an increase of 92.0% sequentially, resulting in diluted earnings per share of $0.64. Non-GAAP net income was $191.0 million, a decrease of 10.0% year-over-year and an increase of 12.0% sequentially, resulting in diluted earnings per share of $0.54. 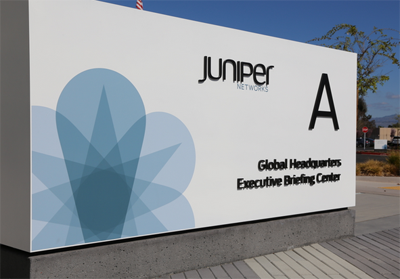 "We reported better than expected Q3 results, as continued enterprise strength and better than expected service provider results more than offset weakness in the cloud," said Rami Rahim, chief executive officer, Juniper Networks. "While our Q4 outlook is being impacted by the pace of deployments at several cloud customers, we believe this is a temporary headwind and remain confident that we have the right products and strategy in place to grow the business in 2019." "We delivered better than expected non-GAAP earnings during Q3, as gross margin exceeded the high-end of our forecast and operating expenses came in at the low-end of our outlook. We also completed our $750 million accelerated share repurchase in the period," said Ken Miller, chief financial officer, Juniper Networks. "While we believe we are making the investments needed to win in the market, we remain focused on capturing additional efficiencies and creating shareholder value." Regarding its outlook, Juniper cited the slower pace of expected deployments by cloud customers for a likely year-over-year decline in revenues for Q4. The company has not seen any impact from Chinese tariffs but said customer buying behavior could be affected and gross margin could be slightly impacted. Routing product revenue: $496 million, down 15% year-over-year and up 1% sequentially, driven by Enterprise and Service Provider, partially offset by a decrease in Cloud. The MX product family declined year-over-year but grew sequentially. The PTX product family declined both year-over-year and sequentially. Switching product revenue: $221 million, up 4% year-over-year and down 13% sequentially. While the EX product family grew year-over-year, the QFX product family slightly declined year-over-year due to the timing of deployments. Security product revenue: $77 million, up 8% year-over-year and down 3% sequentially due to Enterprise, partially offset by an increase in Service Provider. Service revenue: $385 million, down 1% year-over-year and up 2% sequentially. Cloud: $250 million, down 28% year-over-year and down 11% sequentially, due to lower routing and switching sales. Service Provider: $544 million, down 6% year-over-year and up 4% sequentially. Enterprise: $386 million, up 15% year-over-year and down 4% sequentially. At this week's Broadband World Forum in Berlin, ADTRAN is participating in an SDN-Enabled Broadband Access (SEBA) demonstration with the Open Networking Foundation (ONF). ADTRAN is showcasing its integration with multiple OLT and ONU vendors in the latest version of the SEBA reference architecture. ADTRAN’s OLT and ONU solutions are shown in a SEBA pod that is on display in ONF’s Booth (Hall 22a, Booth No. B116). The ONF defines SEBA as a lightweight platform based on a variant of R-CORD (Residential Central Office Re-architected as a Datacenter). It supports a broad range of virtualized access technologies at the network edge, as well as both residential access and wireless backhaul. Verizon Communications reported consolidated operating revenues of $32.6 billion, up 2.8 percent from third-quarter 2017. EPS of $1.19, compared with 89 cents in third-quarter 2017. Year-to-date cash flow from operations totaled $26.2 billion through third-quarter 2018, up $9.8 billion year over year. Year-to-date capital expenditures were $12.0 billion through third-quarter 2018, including spending on the 4G network, the commercial launch of 5G Home, significant fiber deployment in markets nationwide and the pre-positioning for additional 5G services. Full year 2018 CAPEX is expected to be in the range of $16.6 billion to $17.0 billion. Revenue of $23.0 billion, an increase of 6.5 percent year over year. Excluding the impact of the revenue recognition standard, total revenues were $22.9 billion in third-quarter 2018, an increase of 6.1 percent compared with third-quarter 2017. Approximately 83 percent of Verizon’s postpaid phone base for Q3 were on unsubsidized plans, compared with 78 percent in the same period last year. 515,000 retail postpaid net additions in third-quarter 2018, consisting of net phone additions of 295,000, postpaid smartphone net additions of 510,000, tablet losses of 80,000 and 300,000 other connected devices additions, primarily wearables. Retail postpaid churn was 1.04 percent in third-quarter 2018, compared with 0.97 percent year over year. Retail postpaid phone churn was 0.80 percent in third-quarter 2018. The company expects retail postpaid phone churn to increase seasonally during fourth-quarter 2018. Wireline revenues were $7.4 billion. Excluding the impact of the revenue recognition standard, total wireline revenues decreased 3.7 percent year over year in third-quarter 2018. Total Fios revenues were $3.0 billion. 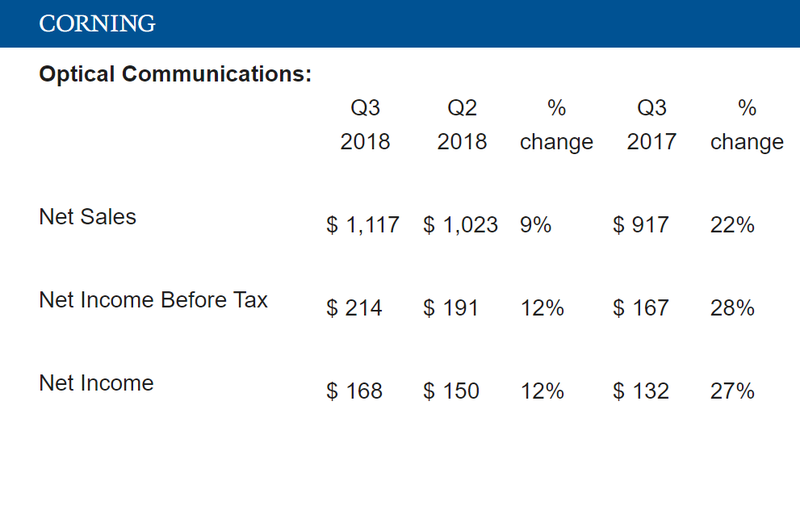 Excluding the impact of the revenue recognition standard, total Fios revenues increased 1.6 percent year over year in third-quarter 2018. Verizon added a net of 54,000 Fios Internet connections, and lost 63,000 Fios Video connections in third-quarter 2018, impacted by ongoing shifts away from linear video offerings. Wireline operating loss was $50 million in third-quarter 2018, and segment operating loss margin was 0.7 percent. Oath revenues were $1.8 billion in Q3, 6.9 percent below the same quarter last year. The company expects Oath revenues to be relatively flat in the near term and does not expect to meet the previous target of $10 billion in Oath revenues by 2020. In the telematics business, total Verizon Connect revenues, excluding the impact of the revenue recognition standard, were $241 million in third-quarter 2018. IoT revenues, including Verizon Connect, increased approximately 12 percent year over year, excluding the impact of the revenue recognition standard. 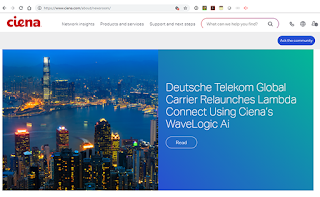 Deutsche Telekom Global Carrier, the international wholesale arm of Deutsche Telekom, is using Ciena’s WaveLogic Ai coherent optical solution for its Lambda Connect wavelength service. The recent deployment is based on Ciena’s 6500 packet-optical platform powered by WaveLogic Ai, which is the industry’s first programmable coherent modem that can scale to 400Gbps per wavelength. Deutsche Telekom Global Carrier is also using Ciena’s Blue Planet Manage, Control and Plan (MCP) domain controller, which automates network and service management and provides visibility into real-time network operations. Ciena will migrate Deutsche Telekom’s network to an optimized, flexible grid network that offers more agility and programmability. Ciena said its solution enables Deutsche Telekom to reach longer distances, deliver end-to-end optical services and achieve finer connectivity granularity for carriers and internet content providers throughout Europe. 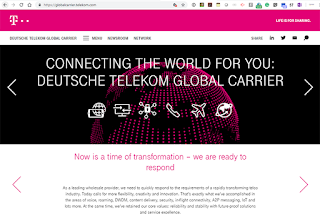 Deutsche Telekom is rebranding and refocusing its International Wholesale Business. 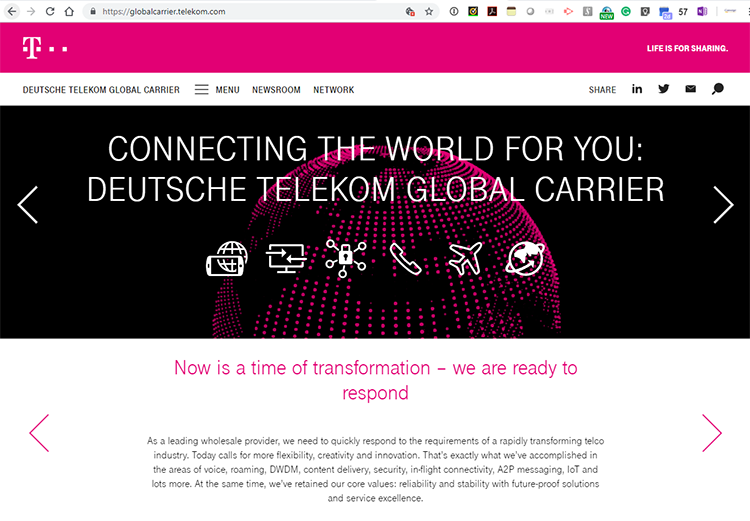 The carrier's international wholesale arm will now be known as Deutsche Telekom Global Carrier. The company said it is implementing a fresh strategy to more quickly provide innovative solutions that will in turn result in a superior customer experience. Deutsche Telekom Global Carrier will leverage big data, AI and digitization to centralize processes and enable a more transparent overview. The result will reduce the time needed for procurement, ordering and delivery. Community Fibre, a fibre-to-the-home internet provider based in London, has selected ADTRAN as its technology partner to deliver 10G residential and business services in the UK. The deployment will leverage ADTRAN’s XGS-PON solutions. Community Fibre is starting with London and expanding into other areas in the UK over the next several years.